Barbara Mary Crampton Pym was born to Frederic and Irena Pym on June 2, 1913, in the town of Oswestry, Shropshire. S In 1931, Barbara entered St. Hilda's College at Oxford. In 1940, Barbara joined the Wrens (Women's Royal Naval Service), and in 1944, she was posted to Naples until the end of the war. After the war, Barbara took a job at the International African Institute in London, and soon became the assistant editor for the journal Africa. In 1971 she was diagnosed with breast cancer and underwent a mastectomy; in 1974 she suffered a minor stroke. She then retired from the Institute and went to live with her sister Hilary. She died at the Michael Sobell House, a hospice in Oxford, on January 11, 1980. She is buried in the churchyard at Finstock. 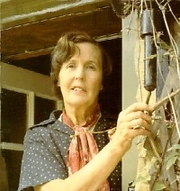 » Barbara Pym's legacy profile. Barbara Pym is currently considered a "single author." If one or more works are by a distinct, homonymous authors, go ahead and split the author. Barbara Pym is composed of 4 names. You can examine and separate out names.